The first season of Arrow has come and gone. The anticipation of CW's newest superhero series based on DC Comics Green Arrow seems like a long time ago and now the wait for Season 2 begins. Following on in the same grounded tone as Christopher Nolan's "The Dark Knight Trilogy," Arrow attempted to bring a modern day and grounded Green Arrow to television. No villains with outrageous superpowers, no Supermen or aliens from another world. Arrow recreated some fan favourite villains such as Firefly, Deadshot, Count Vertigo, China White and Deathstroke while depicting them in a realistic and grounded manner. And it works particularly well for the series. Following here there are SPOILERS for the entirety of Arrow's first Season, including the ending to the Season Finale. Turn back now if you haven't seen it. You've been warned. Starting off I'll continue with my comments about the realistic and grounded manner in which Arrow depicts it's world and characters. Straight away you'll notice the tone is reminiscent of Christopher Nolan's Batman films and I find that that's exactly what the showrunners were aiming for. It's a modern retelling with familiar, yet redesigned, characters. All the fantastical and sci-fi elements of the comics are stripped away for something reminiscent of a crime drama starring a vigilante. Arrow is less of a superhero series and more of a crime drama with weekly targets/cases with an overarching plot pushing the series forward. Action scenes can be frantic, close ups that try to put you right in the middle of the action, and even some shaky cam used to enhance the frantic and fast paced nature of the action. A major change from Comics to Screen is Arrow's willingness to kill. He's prone to leaving his targets alive, dead if necessary, but the fact is that he will kill and it raises questions of morality in the show. 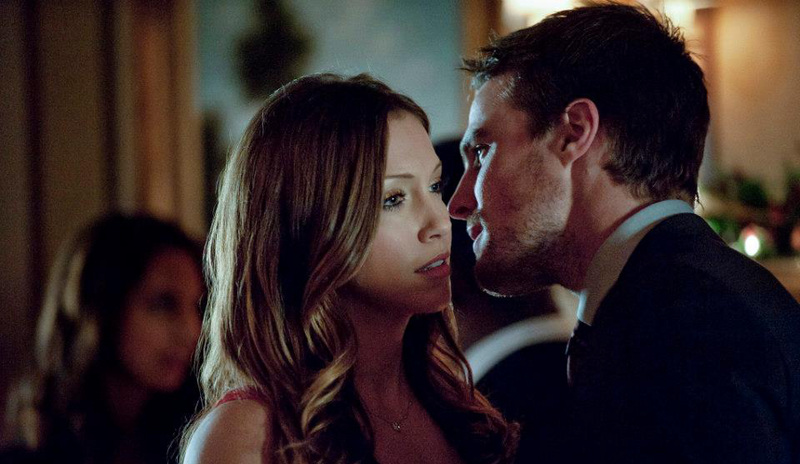 Is it right for Arrow to take lives in the pursuit of a greater good? This theme is constant throughout the series as Detective Lance, steadfast in his belief in the law, relentlessly pursues Arrow. But even in times of desperation the Detective is forced to turn to Arrow for help so whose method is more effective? The steadfast detective or the vigilante? Perhaps a midground between the two. When is it right to take a life in pursuit of the law and justice? An interesting theme throughout the series that many might not take notice of. Alongside the modern day Arrow we see Oliver Queen's past and the series does a nice job of distinguishing between one era and the other. Ollie's experiences on the island are darker. Simple use of colour reduction in the image makes it seem more like reliving a hazy memory of Ollie's past. All the while it helps us dig deeper and learn more about Oliver's experiences on the island and the events that drive him to become the vigilante we see in the present. It's a great offset to the modern day and helps to break up the pace of an episode. Beginning with Oliver being found after 5 years deserted on an island and his return home the first episode serves as a great introduction to the cast of characters. Ollie puts on the hood for the first time and we learn of his father's "List." A book full of names that are systematically destroying Star City. Ollie resolves to see each and every name on his list crossed out as he tries to save his city and make it better for everyone. Now early on in the series the storytelling seems fast paced. Too much information and too many things happening too early on in the story. Three episodes in and someone already discovers his identity, Diggle, who becomes a great central character throughout the series and a partner to Ollie. Five episodes in and Oliver is already caught and questioned under suspicion of being the vigilante with his name cleared by Diggle dressing up in his attire. It's a rough start to the series and everything seems to be happening too fast, but the series soon afterwards settles into a nice pace. When you view the events of the whole season as a whole it works out well. But even then those events seemed to happen too quickly and early on in the series. Greg Berlanti, Marc Guggenheim and Andrew Kreisberg do fine work on the writing and with additional writers on some episodes, Geoff Johns included, the episodes have their ups and downs, but overall finishing on a high. Once the flow of storytelling settles the quality quickly rises as the series gets progressively better. We see fan favourite characters introduced and brought into the mythos of the series, though some are better used than others. Characters like China White, Deadshot, Vertigo and Huntress are put to greater use as their characters appear and reappear as mainstay villains throughout the series and are likely to continue through to the second season. Others, however, like Firefly and the Royal Flush Gang are killed off to never be seen again. In some ways it works in context of the series, but fans of those particular characters may find it frustrating to see these notable names and characters killed off. Deadshot was amongst these notable names after being killed off in the third episode until he is brought back much later in the second half of the season. On the flipside of the table we also see some new friends and allies brought into the mix. Early on we're introduced to Felicity Smoak who starts off as an employee at Queen Consolidated as an IT Expert and later in the season becomes a tech expert assisting Oliver and Diggle. Jessica De Gouw is introduced as Helena Bertinelli aka The Huntress who becomes both an ally and enemy to Oliver. She's set on delivering and handing out justice, but in a much more violent manner than Arrow. Then while we never see him put on the mantle, Colton Haynes is nicely setup towards the end of the series to become Red Arrow, while Willa Holland's Thea is often referred to as Speedy suggesting a crime fighting future for her character. This follows through with Laurel as she is shown to be more than capable of defending herself and hinting towards her future as Black Canary. Even on the island Ollie makes friends with Manu Bennett as Slade Wilson / Deathstroke and Celina Jade as love interest Shado. Arrow features a diverse mix of characters all of whom are well cast. Stephen Amell works great as Ollie and while there are times when he might fall flat he's overall a great choice for the role. Katie Cassidy and Colin Donnell as Laurel Lance and Tommy Merlyn, respectively, work great together and the constant love triangle between the three works really well. Particularly towards the end of the season. Willa Holland is a lovely choice for Ollie's younger sister Thea who throughout the season battles drug and alcohol addictions before slowly and progressively turning a new leaf as she meets her own love interest with Colton Haynes as Roy Harper. Suddenly Thea goes from being the one needing help to being the one helping others. David Ramsay and Emily Bett Rickards are great additions to Oliver's team of crime fighters as Diggle and Felicity. Ramsay is a great offset to Oliver's almost reckless nature early on in the series while Rickards' bubbly personality makes her a humourous addition to the series while drawing plenty of her own dramatic scenes throughout the series. To finish off I need to mention Susanna Thompson as Moira Queen, Paul Blackthorne as Detective Quentin Lance and Colin Salmon as Walter Steele. All three are fantastic in their roles. Susanna as the protective mother torn between doing what's right and what will keep her family safe. Paul as the overprotective father, devastated at the loss of one daughter because of Oliver and unwilling to lose another. The steadfast detective who believes in the law and will stop at nothing to bring in Arrow. Then finally Walter as the new stepfather of Thea and Oliver. But of all the casting in the series none stands as high in regard as John Barrowman as Malcolm Merlyn. Barrowman makes for a fantastic villain throughout the series. Charismatic, strong, persuasive and ruthless and while his overall plans for the undertaking seem terrible, you can't help but feel compassionate for the loss he himself has suffered. This is particularly great in the finale when Tommy learns of his father's plans and Barrowman plays a recording of his wife's dying message. That message being what sends Barrowman on his path to becoming the Dark Archer. By the time you reach the finale you're likely to love just about all the central characters. Everyone sporting some of their most dramatic scenes in the entire series. Walter, leaving his family knowing the truth of why he was kidnapped. Moira, wanting to set things right and revealing her participation in the Undertaking and her subsequent arrest. Thea, frightened for Roy's life as the threat to the Glades is revealed, running into the chaos to find and rescue him. Roy himself selflessly running to the aid of others. Felicity, desperate to stop the Undertaking as she works with Detective Lance to stop the devices planted by Merlyn. This leads to some great moments in which Felicity is shaken by her failure as one of the devices brings havoc to the glades. 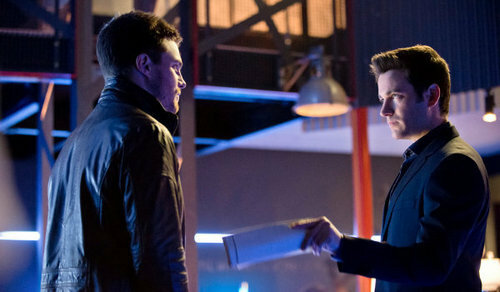 Oliver is at last put to confrontation against Barrowman's Dark Archer and the stakes are the highest in the series. Oliver puts Barrowman to rest after a desperate struggle, but fails to save the Glades. And in a redeeming moment for Tommy he sacrifices his life to save Laurel's. Oliver arrives, but not in time to save Tommy. Season One comes to a devastating ending with lives lost and Oliver overall having failed in his mission to save the city. Overall, Arrow had a bit of a rocky and fast paced opening, but once it settled into it's groove it quickly became one of the best series currently on television. The cast all settled well into their roles and by the end of the series you're wholly invested in what comes next. With the devastating ending of the Season Finale it's surely a long wait to what will hopefully be a great Season 2. Any Green Arrow fan should be watching this series. That season finale was amazing. Pretty much agree with everything you've said. Great job! Wow, Thank you for Writing this!! Great review and overrall great read! I love this show! I still need to get around to watching this show, but alas, so little time. I've only heard good things though, so I'll definetly try to catch up when Season 2 comes around. Season 1 was pretty good! I didn't like the very CW bits but otherwise a pretty solid show. I've been waiting for Season 2 to end so I can watch them all. I admit that I only watched some random episode of Arrow because of Willa Holland (A.K.A. Thea A.K.A. my future wife ) . I eventually liked the series and the plot , and enjoyed Oliver´s character more than in the comics themselves , so I gave it a chance and watched the entire first season and all the season two episodes up to that date . I loved it , even more than Man of Steel . Arrow may be the heir to Nolan´s trilogy .